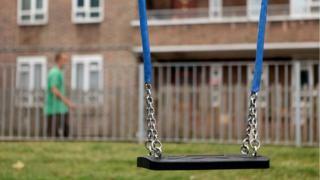 The number of UK children classed as living in relative poverty remains 2.3 million, government figures suggest. The Department for Work and Pensions annual estimate shows the proportion affected - almost one in six - was unchanged from 2011-12 to 2013-14. Average household income in 2013-14 - before housing costs - remained unchanged from 2012-13, at £453 a week - making the poverty line £272 a week. Mr Duncan Smith told the Commons that government reforms of the welfare system were focused on "making work pay" and getting people into employment. He said he remained "committed" to dealing with the "root causes" of poverty, saying employment was up by more than two million since 2010. The figures represented a "depressing slow-down in the progress we should be making as a country", he said. He said: "Government plans to cut struggling families' incomes further by changing tax credits is deeply concerning... this government must ensure that change to the benefits system makes work pay for those on low incomes." Matthew Reed, chief executive of the Children's Society, said there has been a "steady rise" over the last five years in the numbers of children living in poverty in households where parents work. Alison Garnham, chief executive of the Child Poverty Action Group, said the figures made "grim reading", adding: "The government is not going to meet the child poverty targets." It comes as the government has said it wants to change the way child poverty is measured - as it believes the current measurement is inadequate. David Cameron's official spokeswoman said the prime minister "remains committed to doing more work to eliminate child poverty and that is precisely why the government wants to look at having an approach that is focused more on tackling the root causes of poverty than treating the symptoms." Media captionIain Duncan Smith: "If you deal with the root causes of poverty, at which work is a critical component, many of the symptoms then start to sort themselves out"
The "experts" are scratching their heads. Today was the day, we were told, when we'd see a sharp rise in poverty as official figures included the full impact of welfare cuts for the first time. But, instead, the numbers have remained broadly flat and the government is able to claim that "the proportion of individuals with low income is now at the lowest level since the mid-1980s". The Child Poverty Action Group said the figures still made grim reading. "Make no mistake, we are facing a child poverty crisis in the years ahead," it said. But one cannot help but think their statement would have been rather different if the expected rise had come to pass. So what is going on? Is it time to ask if welfare reform is working? Jonathan Cribb, from the Institute for Fiscal Studies, said the child poverty figures appeared to have remained stable despite cuts to working age benefits because of the rise in employment. "That seems to have off-set the impact of cuts to working age benefits which will have suppressed incomes," he said. The DWP figures have mostly been estimated from a survey of 20,000 households in UK. The data for 2013-14 includes figures suggesting the number of children living in relative poverty before housing costs were taken into account was 100,000 lower than the previous year. However, the DWP said it was "not trumpeting" the finding as the polling was subject to a margin of error. The figures also showed that 9.6 million people - about 15% - were on relative low incomes in 2013-14. The figure represented a fall of 100,000 on the previous year - and is down from 11.2 million in 1998-99 when comparable records began. The number of pensioners living in poverty increased by 100,000, the DWP said. Janet Morrison, chief executive of Independent Age - the older people's charity - said pensioner poverty remains a "significant and widespread problem". For many the reality was not "foreign holidays, but finding the cheapest food and managing to keep the heating on in winter", she said. Video How do you define child poverty under the current system?